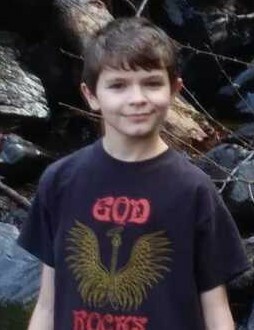 Maddox "Max" Elijah River Belew, 14, of Statesville, North Carolina, passed away on March 12, 2019. He was born on February 4, 2005, in Oakridge, TN, to Kelli Blair Miller Belew and Daniel Scott Belew. Max was a student at Iredell Charter Academy. In addition to his parents, Max is survived by his sisters, Morgan Hughes and Mya Belew; maternal grandparents, Stanley and Cheryl Bean, of Salisbury and Garry Miller, of LaFollette, TN; maternal great-grandmother, April Hazel Hovater, of LaFollette TN; maternal step-great grandmother, Ruth Bean, of Salisbury; and paternal grandparents, Robbie and Norma Belew, of LaFollette, TN. Services will be at 4:00 PM on Saturday, March 23, 2019 at Cavin-Cook Funeral Home in Mooreville, North Carolina. Cavin-Cook Funeral Home & Crematory, Mooreville, is serving the Belew family. Condolences may be made to the family at www.cavin-cook.com. This obituary is courtesy of Martin Wilson Funeral Home "Where Families Matter Most"